We also provide online fire marshal training and fire warden training , courses can be taken by staff from their office or mobile phone! Ask about combining an open course place with online fire refresher training. We offer a discount if both are booked at the same time. Live fire extinguisher session (optional). Daily and monthly duties of fire marshals. Evacuation and accounting for persons. We hold open fire marshal training London courses in London. Open courses are held at Lewisham Southwark College, close to Southwark station. The station is the Jubilee underground line. Southwark College is a new and vibrant building. Snacks are available for those that want to stay for lunch or have a speciality tea or coffee at The Cafe SE1 located in the central atrium. Our open fire marshal training London course is a three hour programme. All open courses are morning sessions and are held every month. In addition, your team can hire the venue in the afternoon for your own fire training session. It can also include live fire extinguisher training. Furthermore, we can include your plans and procedures. Cost of open fire marshal courses are just £75+VAT per person. This fire marshal training / fire warden training course in London includes a live fire extinguisher session, tea / coffee and all persons get a certificate. Persons on this course also get online training notes for their type of workplace. Our open courses fill up fast, so you should book your places as soon as possible. We hold all telephone and email bookings for five working days. We will confirm your course once we have your details. You must also agree our terms within five days. Either call or email us for more details or dates for our fire marshal courses. Do you need off-site fire marshal training London courses? Do you want live fire extinguisher sessions? Then we can book a venue for you. Our normal fees apply, plus the cost of the venue. We can provide off site training Stratford Circus Arts Centre in London. In addition, we can also supply training at Lewisham Southwark College. These venues are subject to availability and also venue hire costs. The Stratford Circus Arts Centre and Southwark College, South London have outside spaces where we can provide live fire training. These spaces are limited to up to twenty persons. Either call or email our training team now if you need off-site fire marshal training London courses.We can also provide tea and coffee for your staff at the venue. These are available at a small extra cost. Our team can also run fire training at a venue of your choice. You will need to contact us if you want to include live fire extinguisher training. We have strict outside space requirements. Can we change the content of our course for your staff? Yes, we can change the course content so it applies to your building and plans. We can do this in two ways. Our trainers can either come to your building to take pictures of risk and look at your fire plans. This is so we can be sure to highlight the most important issues for your staff. However, if you prefer, you can send your plans and also pictures of risk yourself. We will change our course to tailor it to your plans and building. Why is this a good idea? It will make your fire training workplace specific. We will also be able to do a tour of your workplace highlighting any hazards or issues that can affect your escape in the event of a fire. Our trainer can also carry out a live fire training exercise in your car park, so you staff can tackle some real fires. Remember, all persons on the course will get a training certificate and online fire training notes. Check this page out for a new and exciting venue your staff fire marshal training London programmes. Our team offer in house fire marshal courses London at your site. The courses can be changed to include your fire emergency plan and fire evacuation plans at no extra cost. Our London in house fire marshal courses are for any number of persons for the same fee. The staff on your in house fire marshal course will each get a training certificate and also online fire training notes. The notes will be based on your place of work. If you need a live fire extinguisher session with your in house fire marshal training London programme, read the paragraph below. All of our trainers have worked as fire service trainers. They have trained thousands of staff using fire service advice and guidance. All of our courses are based on government guidance, British Standard notes and also fire service published material. You can hire our venue to carry out your tailored fire marshal training. We can also carry out live fire training at this venue. In addition, you can send us photographs of any fire risk for the hazard spotting session. We can also visit your site and take photos of any risks that we see. Lastly, we can change the course content to include your fire emergency plan and fire evacuation procedure. So what’s the cost? Our normal in house fire marshal course fee applies. There is also a small fee for the venue and any refreshments you choose to have for your staff. All persons on this course will get attendance certificates. In addition, they will get online training notes and any hand outs you give us for your team. We can also carry out a fire risk assessment or audit of your workplace. Therefore we can discuss any faults we have found so that your staff have a greater understanding of risk in their building. If you want a test for your fire marshals we can also carry this out. Therefore you will know who has passed the fire marshal training for your workplace. Either call or email our team for more information. Many of our clients want a fire extinguisher practical session to add to their fire marshal courses. We offer fire extinguisher session using a safe LPG fire training rig. Our team use water, foam and CO2 fire extinguishers on the practice fires. We also use of wet chemical extinguishers if asked. A space of about five car parking spaces. Away from combustible or flammable materials. An area not visible from a main road, so we don’t cause accidents! An area controlled by you / or that you are allowed to use. Flat and also hard standing. We limit the number of persons on the fire extinguisher practical sessions to about twenty persons. However, managers can have more persons tackle fires by doubling up on practical sessions. This is how it works – Group one of twenty will take part in the practical session while group two have a coffee break. Once the first session is finished we swap over. This is so that about forty persons can have live fire training! Need more? We can also add a third practical fire training session at the end of the course. This means you can have up to sixty persons have live fire training for one low price! There is an additional fee for this service to cover extra time and also fire extinguisher recharging. Sometimes we will have to cancel live fire training sessions due to extreme weather conditions. This may happen if there is severe snow and also very high winds. In the rare event that this happens we can provide a part refund for your course or offer places on our open courses. On very rare occasions we may have to cancel the course and come to your site another day. This has only happened once in nine years, so happens very rarely. What is the difference between fire marshals and fire wardens? Fire marshals and fire wardens do the same job. Some organisations may ask fire marshals or fire wardens to do slightly different roles. For example some may have an emergency role and also a proactive fire safety role too. Their role may include safety checks, testing equipment and alarms etc. They may also help with developing new fire evacuation plans. Latest fire warden courses. How often do you hold open fire marshal training courses London and fire warden training courses London? Our open courses are held every month. Most courses are held in the morning from 10 a.m. to 1 p.m.
We advise that persons wanting to book staff on this course do so as early as possible. These courses are very popular and some companies hold block bookings each month for their staff. Therefore this can sometimes make other spaces limited. Our fire marshal and fire warden training courses are now held at Lewisham Southwark College. The course is held at the Southwark campus. This is just metres from the Southwark tube station entrance. How many persons can attend a fire marshal courses London session? If your staff attend one of our open courses we limit the numbers taking part in the practical session to twenty to twenty four persons. Therefore, if we have more than twenty persons on the course we sometimes carry out two practical sessions. Any person wishing to fight a small fire using our rig can do so. We use water, foam and CO2 extinguishers. If you decide to have an in house course, you may place any number of persons on your training session. If you select a live fire training session to add to your course, we limit the numbers on this session so that we can keep every one safe. You may place any number of persons on the classroom sessions, so this course can represent great value for money. 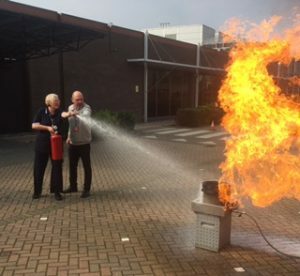 If you need more than twenty persons to have hands on extinguisher training on your fire marshal course, we can either carry out two separate fire marshal training sessions or have a double practical session. Can you run courses in the evening? Yes we can run in house twilight and evening sessions as well as morning and also afternoon courses. We can run a live fire training session in the evening but we do need good lighting conditions so that we keep everyone safe. Our team recently undertook an evening session for sixty persons. We provide individual certificates for up to twenty persons on a course. Our staff can also print your attendance list for those requiring greater numbers trained. We do hold open fire marshal courses / fire warden training courses in the evening. Do you work for the fire service? No we do not work for the fire service. We used to run fire warden training courses for the fire service safety partnership. We no longer operate with us in this way. However, we have carried out fire training for fire service personnel to use evacuation equipment. All of our team have previously worked for the fire service as commercial fire trainers and as operational officers. Other roles included emergency planning officers, fire safety inspectors and other safety roles. These skills allow us to run courses that meet fire service standards. We also carry our regular CPD or continuing professional development. This makes sure we keep up to date with all new advances in fire safety and the law. Do you provide online fire marshal training / fire warden training courses? Yes we do provide on line fire training courses. 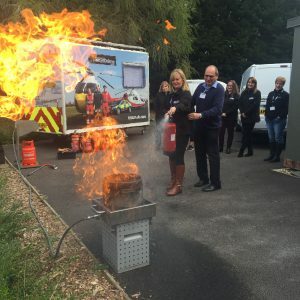 We currently offer three types of course: Fire marshal for office staff, general fire marshal course, staff fire training for offices and also general staff fire training. In addition, we can provide secure online fire training websites for your place of work. This means that only your staff can see the course content. The courses are about fire safety issues in your building. Nearly all other providers offer general courses that are not about your workplace! You can also ask about buying places on fire marshal training / fire warden training London course and have access to our online fire training courses. The normal price for online fire training is £20+vat. However, your fire marshal can have one years access to our online fire training package. So your fire marshals can check any details they may be unsure off during the year. Do you discuss high rise buildings? Yes we do discuss high rise buildings and their fire safety issues. After the terrible Grenfell Tower fire many clients want to know what to do in case of fire in their home. Therefore we discuss fires in tall buildings. We look at working in high rise buildings and also the precautions and advice for living in high rise tower blocks. Staff working in high rise buildings may be considered as working in a higher risk building. 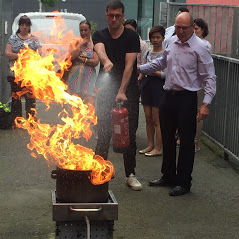 It is therefore important that fire marshals receive fire marshal training / fire warden training London courses more frequently than other persons. Is practical fire extinguisher training a legal requirement? Managers for fire safety in a building have fire safety duties. They must have a fire risk assessment and also a fire emergency plan. In addition, they need to train a number of persons to carry out fire safety evacuation plans. The content of staff fire training includes fire fighting equipment in the workplace. This includes fire extinguishers and any other fire suppression systems. They must also carry out fire drills to practice any plans. However, there is no legal requirement to take part in a hands on fire extinguisher training session. If you want to discuss how your staff can have hands on fire training either email or call us. Even if you do not have a suitable outside space, we could hold a course at one of our external training venues. Will my staff be safe when they carry out the practical session? We always carry out a dynamic risk assessment of the training areas and also weather conditions. In addition, persons on the course are always with a trainer when tackling the fire. The fires are fed by LPG and this is always off when they start tackling the fire. Lastly, we ask that students where eye protection if they do not wear glasses and also gloves when using our CO2 extinguishers. This is purely as a safety precaution when taking part in a training exercise. Students may be asked to remove scarves, bags and free flowing materials that may catch light. We ask all staff to ensure that they wear flat shoes with good grips and soles. So what are the options for managers? On our open fire marshal courses in London. Have an in house training course. Use our online fire marshal training. Have online fire marshal training course and then take part in a discounted fire extinguisher session at one of our open venues. So what do our fire extinguisher sessions include? We talk about the different classes of fire. Our trainers will concentrate on the type of fires that are common in your workplace if you book an in house course. We also discuss all types of fire extinguisher. Once again, we will concentrate on the types you have in your workplace on site training courses. Remember, we can train about twenty persons on an outside fire extinguisher session. Ten persons will get hands on training but you can add more persons for a small fee. All persons on our courses will get a fire training certificate or have their name printed on a company issued certificate. For details either call or email us now. We offer a range of fire safety services. These include fire risk assessments and fire safety audits. We also second opinions and produce fire emergency plans. There are many ways to achieve fire safety. Let us help you meet your legal duties within in a manageable budget. We are often asked whether we carry out fire door surveys. Our company can carry out a third party inspection of your fire doors and provide an opinion on whether they will hold back a fire for a prescribed period. We offer certification and reports on all doors surveyed. We can also provide online induction training for your staff. Our team can purchase a web name for your workplace and add all types of induction training for you. You can supply us with videos, texts and pictures and we will create lessons for your new starters. Your staff can access this site as many times as you wish. We charge a set up fee and then a low annual renewal fee for induction training. Remember you can have fire training, health and safety training and also much more. Either call us or email us for more details of this service. For open fire marshal training / fire warden training London sessions. Either email cityfiretraining@gmail or call us. We will ask for information and also for you to agree our terms. Once we have your info, your place is booked. For in house course either email us or phone us with your preferred date. Once we have agreed you fire marshal training / fire warden training London date, we will send you a booking form. You must provide us with the info we require within five working days. Once we have the information your course is booked. What happens after your fire marshal training London course? After you have completed your fire marshal training / fire warden training course with us you may still have a little work to do! Our open fire marshal training / fire warden training London courses are attended by different companies and organisations. Some are also different types of workplace such as care home, offices or shops. Therefore, the courses are generic and cover general fire marshal advice. We are often asked “How many fire marshals do we need?”. The number of fire marshals will depend on the type of workplace. It depend on the amount of floor space, whether the public are present and also the level of risk. Lastly, it will depend whether your workplace operates a roll call or sweep system to evacuate and account for persons. 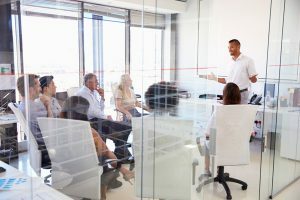 If your workplace has a low number of employees and it is obvious whether a person is in or out of the building a roll call may work in your building. Roll calls are also used by some workplaces as out of hours procedures. If operating a roll call, you may only have to train one or two fire marshals. Workplaces that are larger should use a type of sweep system. Published fire service advice suggests that buildings need one fire marshal for every sixty seconds of search area. In addition, workplaces would need an appropriate amount of deputy fire marshals in case of absence, sickness, annual leave etc. Our in house and open fire marshal courses / fire warden training look at all of these issues. We can even recommend the number of fire marshals/ fire wardens you will need once you have discussed your workplace with us. For more details of how many fire marshals your workplace needs either contact us or book on a fire marshal training fire warden training London course. Managers can contact us by email or they can call us on 0207 419 5001. Remember booking a course with us is so easy. Once we have agreed in house dates or provisionally booked you places on our open courses, we will ask for some details and you to agree our terms. Once we have your details, your course is booked! Go on – call us now! So what does this mean for persons on our courses? After taking the course, persons who have attended need to look at their plans. The first is the fire emergency plan. We have talked about the content of a fire emergency plan on the course, so you should know what is in them. Your workplace fire plan will detail all of the fire safety issues in your workplace. Read this plan carefully, so you understand the issues raised in the fire risk assessment. The next plan that persons on the course will need to read is their fire evacuation plan. This will tell all staff and fire marshals what happens when the fire alarm sounds. There should also be more than one plan for persons working out of regular hours. Make sure you know all of these plans. You may be a fire marshal at all of these times. Lastly, their will be the disabled evacuation plan. This may be very simple or it may be more complex in a large building or where there are a number of disabled staff, service users or guests. You will also need to carry out fire drills. We have talked about these on the course too. Make sure you have practised your fire marshal role in a fire drill. Remember fire drills serve a number of purposes. They are a legal requirement, they let fire marshals practice their emergency role, they let all staff practice the fire procedure and a fire drill also helps identify any changes needed in your plan. You should also consider, that although some staff may have carried our many fire drills. Some persons will be new to the workplace and may never have taken part in one. Lastly, you must record all fire drills in your fire log book. If they are not recorded, the fire service inspector may consider that it has not been done. Any false alarms that lead to a evacuation, can also be counted as a fire drill. All persons who have a fire safety role or who work in a building need regular fire training. This is a requirement of fire safety law. The frequency of training will depend on the level of risk in the place of work. Your manager may send you on our fire marshal training / fire warden training London courses regularly. In addition, the manager may ask you to carry out our online fire marshal training courses as a refresher programme. If you or your manager need more info about this why not contact us. Either call or email us for more details. What happens on a live fire training session? We are often asked what is included in a live fire training session. We use an LPG fire training rig, water, foam, CO2 and wet chemical fire extinguishers. Our trainers simulate some small fires that can occur in a workplace. These include a small bin fire that attendees can fight with an extinguisher. They can also use a foam extinguisher too. We also simulate a live electrical fire and attendees can use CO2 extinguishers on the fire. If your staff do not want to take part in the session, we understand. We never make anyone to take part! Our staff have strict health and safety rules. We carry out a risk assessment to make sure that the place and conditions are safe for an exercise. We also ask those not wearing glasses to wear protective eye wear and also gloves when tackling a fire with a CO2 extinguishers. In addition, we check for correct footwear, no dangling scarfs or anything that can catch light. Our trainers have carried hundreds of these fire training sessions. We produce fire training that is fun, safe and that will also help staff gain confidence to tackle a small fire. If you need more info about live fire training sessions why not contact our staff. You can either call or email us. We will tell you what you need for a live fire training session at your staff. We can also tell you what will happen if there is bad weather that may interfere with your fire training session. Fire safety can be explained quite simply. First carry out a fire risk assessment and see what is wrong. Put the faults right! Then make a plan based on the workplace. Lastly train everyone in the building. All staff staff need fire training. Persons with a fire safety role will need more sessions. This includes fire marshals, persons calling the fire service, evacuation buddies etc. Our inspection, plan and fire warden training combo is an easy way to comply with fire law, have a plan as required by law and then train all staff. This can be carried out in one day in a simple workplace, but we may need longer in a larger or riskier building. Our teams provide IFSM accredited fire training. The fire marshal course has four sessions. Since the fire extinguisher training is based on the first two sessions of the fire marshal course, we can train all of your staff in one training programme. We can also include a live fire extinguisher session for both groups in you have a suitable outside space. This double training session does not cost extra! So you can train all of your regular staff and fire marshals in one fire training course. Either email or phone us for more details of this offer. Do persons on a course have to take part in the practical session? No. If a member of staff has an injury or condition that means that cannot or do not want to take part. That’s OK! Some persons may not fill confident or strong enough to lift an extinguisher and tackle a fire. Since some extinguishers mean getting as close as one metre (water mist) or one and a half metres (CO2) from the fire, some persons would rather not do the exercises. There is no requirement to do the practical session to complete the course. However, just to make sure your staff are safe we: carry out an assessment of the area. This also includes an weather conditions on the day of the training. Use an environmentally friendly training rig that controls the size of the fire. The gas supply to the rig is turned off before a student tackles the fire, so it will not get larger during the exercise. All persons on the course will also be next to our trainer when fighting a fire. Ask attendees to wear gloves and eyewear for CO2 extinguisher exercises. We have carried out thousands of fire safety exercises without incident. We are proud of our safety record! Still not sure? So call us our email for more details. Have you been let down by another fire trainer? So you need a new trainer quickly! We have a large number of trainers, so often have dates available for persons who need training quickly. Since our courses are IFSM accredited and we are also an approved fire training centre. You can be assured our training will be well received by your staff. We are so good, you may even book us for all future fire training sessions! So how much does a late training session cost? Our fees are the same as regular in house course fees. £345+vat for a non practical session course or £545+vat for one with live fire training. You can place any number of persons on the course for this fee but we do limit numbers of persons on practical sessions to about 20. We will ask for a payment prior to the training. You will also have to agree our terms and conditions too. Our trainer will also call you to discuss site arrival times, room layout, also outside space requirements (if applicable) and answer any questions you may have. Do you ever cancel fire training sessions for poor weather? Our terms do say that we may have to cancel because of poor weather. However, we have never cancelled a course yet! In February 2018, the country saw red weather warnings but we still made it into London and carried out fire marshal training London sessions for a charity that provides shelter for homeless persons. We got to the venue, cleared the snow and also had an outside fire extinguisher session. That is the type of service that we offer! Does everyone get a fire training certificate? All persons on our open courses will get a fire marshal training / fire warden training certificate. They will also get online training notes if asked for. Persons on our in house and off site courses also get certificates up to 20 persons. If you have a few persons over this number we will also provide certificates. If you have a high number of attendees we may have to offer a general training certificate with names of persons on the course on the reverse of the certificate. Does this course cover fire safety checks? Yes the course does cover some of the regular in house checks required by workplaces. On the course we will discuss daily, weekly and also six monthly fire alarm tests. In addition, we talk about daily, monthly and annual emergency lighting tests. Our trainer will also look at fire extinguisher, fire door and fire exits checks. Did you know we also offer third party fire door certification. If your fire door has been altered or repaired it may no longer withstand fires for the times it was originally specified to do. Our qualified fire door assessor will look at your door and can tell what upgrades may be needed and provide a professional judgement of the fire doors efficiency. How many persons will there be on an open fire marshal training or fire warden training session? The numbers on open courses will vary. Sometimes it just a few and other times there could be up to 40 persons on the course. If we have a large number of attendees, we will split the fire extinguisher practical session into two groups. Therefore we can have a smaller and safer training session! Why are your fire marshal training and fire extinguisher open courses on the same day? Our fire marshal training / fire warden training and fire extinguisher courses are run concurrently. The first two sessions are fire law and also fire extinguishers, followed by a practical session (This is our extinguisher course). These lessons are the first lessons in our fire marshal training and fire warden training courses. Our extinguisher attendees leave at this stage. Our fire marshals and fire wardens stay for a further two lessons. Why do we need to send the names of attendees before the course date? We ask that we have the names of attendees for two reasons. Firstly, we can prepare certificates of attendance and give these out after attendees have completed the course. Secondly, our open venue needs names of attendees. They need names of all persons on the college campus to meet their safeguarding policies. Is online fire marshal training suitable as refresher training? Fire training for persons with a key role should be based on the fire emergency plan of the workplace. Some organisations choose to carry out face to face training and then follow up online training. Our online fire training courses can be provided as off the peg courses. A person selecting this option would need additional input using there fire emergency plan. Our tailored and bespoke online training programmes can be include your fire emergency plan and site fire procedures. These would pass any suitable and sufficient fire training criteria required by an inspecting officer. Our online fire training websites can be specifically built for your workplace. You will receive a unique web address and sign in. Each user would get there own username and password to access the site. Does everyone on an in house fire marshal training course get a certificate? We provide individual training certificates for numbers up to 20 persons. We also provide general certificates for numbers in access of 20 persons. How long does the fire marshal training certificate last? All fire marshals need to be trained on a regular basis. The Fire Safety Order does not specify training frequency, so retraining should be based on the risk in the workplace. Workplaces where this is a high life risk should have more frequent fire marshal training. Places such as care homes, hotels and other sleeping risks should have training at least once per year. In addition, workplaces where highly flammable liquids and gases should also consider frequent training. Workplaces which are lower risk such as offices and also shops can have less frequent training. This may be every two years or even three years for very low risk, low occupancy workplaces. Our team are happy to give advice on fire training frequency. So if you are still unsure contact our team. Either call or email us and we will get back to you.